Fom Halloween parties, events and festivals to Oktoberfest, food fests and more, this October 2016 has TONS of events in Orange County for you to enjoy. 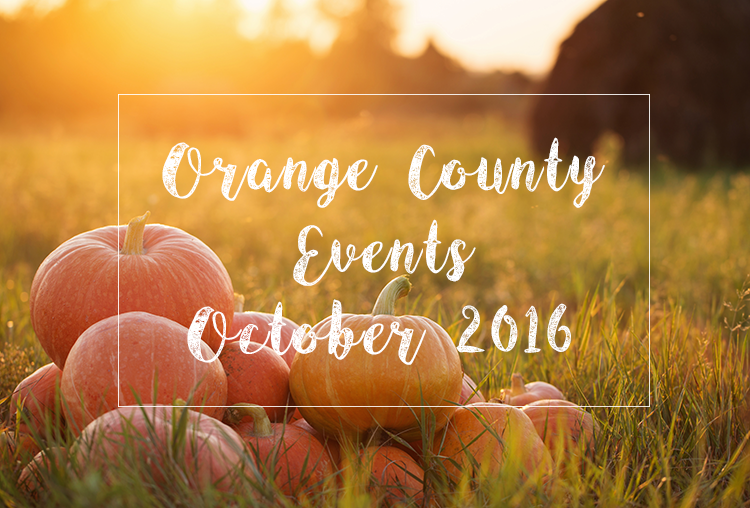 Check out the list of haunted houses, special Halloween events, and more community fun going on all around OC this month. Time to make some room on your calendar for fun this month. Disneyland will be hosting Mickey’s Halloween Parties for a whole new haunting twist on the happiest place on earth. Your ticket to the party includes 5 hours of themed fun from trick-or-treating around the park to villainous character meetings, a special fireworks show, special Halloween themed attractions and the all-new Headless Horseman ride. Costumes are welcome and encouraged for kids and adults alike! This haunted house takes the experience to a whole new level. Your endurance will be tested as you progress throughout twenty-one unsettling rooms for 34 minutes of psychological terror. There’s even a safe word (Mercy!) if you need to be escorted out of the maze. But don’t worry, they go over all of that in the liability waiver you need to sign before going in the maze. Can you make it through the 17th Door? Get your Lederhosen on, there plenty more weekends of Oktoberfest to enjoy! Festivities include authentic German Polka Party music and live bands plus tons of beer of course. General admission is $10. Sunday Oktoberfest Brunch will be open from 10AM-2PM. The last weekend of Oktoberfest will be a special mash up Hauntoberfest for the whole family. The perfect place for the kids to enjoy some seasonal fun, the Irvine Park Railroad’s Pumpkin patch has tons of activities including face painting, carnival games, mini train ride, pony rides, bike rentals, paddle boat rentals, hay rides, hay maze, panning for hold, John Deere racers, a small haunted house and cookie decorating. Stop by for the fun! The Daytime Festival runs Saturday and Sunday 2PM-6PM in the Grand Tasting Pavilions with food, drinks, and live demonstrations and lessons. Indulge in the best OC cuisine from restaurant executive chefs serving up bites. There will also be world-class wines to sip while sommeliers educate on-site. Specialty cocktails and craft beer served throughout the grounds as well. What’s new about this year’s event is the Taste Around Town Events going on Thursday and Friday. During this time guests can join the chefs and masters at special VIP events taking place around Newport Beach restaurants for intimate settings, fine wine tastings, and more. For tickets and full details, check out the website. An annual event since 1957, the three-day festival celebrates Orange County’s agricultural heritage and allows non-profits to raise much needed funds. Enjoy carnival rides and games, food, Tiny Tiller contest, baking contest, live entertainment and more fun all weekend long. Admission is free and carnival ride and game tickets can be purchased at the event. Come and sample dozens of craft beers and unlimited gourmet tater tot creations designed by creative chefs for your guilty dining pleasure. Held at the Orange County Fair Grounds, there will be two rounds of tastings; 11AM-2PM and 3-6PM. To round out the delicious day, there will be live music as well to keep the party going. General admission tickets are $40, designated driver tickets for unlimited tots only are $25. To celebrate the spooky season, the Frida Cinema in Santa Ana will be showing Halloween themed family Sunday matinees. Check out the schedule and get your tickets. Adult tickets are just $5, kids $1. The 29th Annual San Clemente Seafest at the pier will include a Chowder cook-off, arts and crafts show, surf contest, live entertainment, family fun contests and more. Enter the cook-off an individual, team or restaurant or just come by for the chowder tastings and judging. Contests (with prizes for first, second and third) include a hula hoop contest, Costco diaper derby, Rocket Fizz soda pop and candy shop bubble gum blowing contest, jump rope and tortilla toss contest. The award-winning haunted attraction “MOTEL 6 Feet Under” returns for a second year, kicking off with a catered opening on Friday, October 7. The popular maze returns with so many confusing twists and turns, baffling illusions, and animatronics, live and undead characters that there are too many surprises to see in just one pass through. Admission is $15 or $25 for the fast pass. Hosted by various members of the beloved Dirtybird record label, this crazy festival brings music fans three days of nonstop partying in a hilariously authentic summer camp environment. Held in Silverado Canyon, the Campout offers ‘campers’ traditional camp activities like archery, tug-of-war, Slip’N Slide and more. Dance into the wee hours of the night at the most epic summer camp experience you’ll ever encounter! Fun for the kids, the Autumn Harvest Festival at Heritage Hill Historic Park in Lake Forest will be bringing fun-filled adventure for the Halloween festival. Enjoy the Indiana Jones Trick or Treat Stations, experience the Under the Sea Adventure Maze, and dare to visit the Haunted School House. Children of all ages can participate in ghoulish games, costume contests and the pumpkin decorating zone. Don’t forget to come in costume and bring your trick-or-treat bags! Enjoy delicious samples from participating BBQ teams at the Dana Point State Championship. Tasting tickets are $2 each and proceeds benefit the Dana Point Veterans of Foreign Wars. Enjoy the live music, selection of cold beers and the excitement of delicious competition. Don’t forget to take advantage of the free parking and shuttle service from Dana Hills High School starting at 9AM and ending at 6PM. Held in the beautiful historic Mission San Juan Capistrano, the campus with 200-year-old adobe buildings will be lit up for a night of delicious cuisine. Featuring 20+ local restaurants, bakeries, wineries and breweries, your ticket to the event gets you all you can eat and taste for the whole night. Rain or shine the party will be going with live music and fun all night long. Launched in 2010, the OC Film Fiesta in Santa Ana is a cinematic celebration of Orange County’s Latino and multicultural heritage. Each year, the Film Fiesta presents an award-winning selection of feature films, documentaries, short films and activities for a diverse audience of families, students, artists, professionals and lovers of cinema from throughout the county. The 60th annual Buena Park Silverado Days are here celebrating hometown family fun. Events include the Annual Baby Classic, pie eating contest, Mutt show and contest, Hog Calling Contest, live music, games, crafts, rides and more. Check out the website for a calendar of all the events. Foodbeast presents the second annual Oozefest, a festival dedicated to everyone’s favorite ooey gooey treat – cheeeeese. Come for the Marketplace of deliciously decadent cheesy themed foods to buy as you grub or purchase a VIP all you can eat ticket from 5-9PM. Held in Downtown Santa Ana, VIP all you can eat tickets are $50 (including beer as well) and $5 for entrance to the Marketplace. While you aren’t stuffing your face with delicious cheese bites and local brews, you can partake in a handful of unique interactive activities like a game of Pizza Roulette with the Jinny’s Pizzeria crew or a cheese pizza-slice eating contest. The festival presents and features one of the most revered expressions of Mexican artistry and tradition, the legendary music of the Mariachis. The event will include free admission during the day to food, crafts and other local vendors as well as a showcase Mariachi concert at 6PM – tickets $25. Grab your brooms and fly away with us as Pacific Symphony performs selections from the Harry Potter films and more, complete with presentations by a professional magician. Dress as your favorite wizard, sorcerer or other Halloween character for this special Hogwarts Halloween. The fun also includes an interactive Music Carnival an hour before each concert where kids can test drive a musical instrument, meet the performers and enjoy Harry Potter themed arts and crafts before the show. Come in costume to the annual Hauntoberfest at Phoenix Club in Anaheim. The German Band is still in the house for the Halloween, Oktoberfest mash up event you’ve been waiting for. The Oktoberfest season is ending with the craziest costume party around. Beer and sausage eating finalists will be competing for the grand prize on Saturday Oct 29th at 7PM. IT’s fun for the whole family with a balloon man, free choo-choo or fire engine rides, bounce house and more. From the Creators of Midnight Kiss NYE, get your thrill on this Halloween at the magnificent Haunted Hotel! This amazing Halloween bash will be the best Orange County Halloween costume party this year. Fun includes top DJs and top 40 hits, VIP bottle service packages, areas to mingle and dance, contest, party favors and more. Put your detective skills to the test to solve a murder in Laguna Beach. Your team will compete against up to ten other teams scattered throughout Downtown Laguna Beach, each leading their own separate investigation. The team that solves for the murderer needing the least help from headquarters wins! The game lasts about four hours and will require traveling about 3-4 miles on foot. Murder Mystery scavenger hunts also available in San Clemente and Old Town San Diego. SoCal Vegfest is a free vegan festival designed to inspire consciousness in people of all ages and learn more about healthy eating. Festival fun includes guest speakers and celebrities, food sampling, live music, cooking contests and demos, yoga and meditation workshops, cruelty-free vendors, fun for kids and a Halloween Contest. The conscious fun will all be happening at Orange Coast College so you can learn more about the lifestyle. If we missed your favorite event this month, leave a comment and let us know! Share your Orange County for October 2016 so no one misses out on the fun.